After an unexpectedly long gestation period, Mary, Mary, the sock pattern will be released this weekend! My apologies to some of you whom I know have been waiting for it to be released! It has been an interesting and educational exercise to design this sock. Before the pattern is released, I thought it would be a good idea to introduce some of the aspects of this sock’s construction, especially for cuff-down knitters like me who are generally leery of toe-up construction. I know that there are many toe-up fans out there, but until now, I have definitely been in the cuff-down camp. My primary reason for this is finding that cuff-down socks were so much more intuitive to knit. And as knitting is very much about stress-relief for me, I certainly didn’t want to have stressful experiences knitting my socks! Complicated and fiddly cast on instructions for the toe. Complicated and long instructions for the heel that caused my brain to melt and my eyeballs to roll into the back of my head just reading them. Often unattractive heel that doesn’t fit very well. Generally much fiddlier to get ‘right’. These factors all added up to Unhappy Knitting for me, causing me to shut the pattern and walk away. Unhappy Knitting is not something you want in your life. It’s the reason I have taken a very long time to even attempt to design Mary, Mary, which has to be knitted toe-up in order for the central motif to work. Like most things, if you began sock knitting life as a toe-up knitter, you will probably be reading this and saying “but once you know how, it’s not an issue”. And I agree. I decided to be brave and tackle the job of finding solutions to those aspects of Unhappy Knitting because I really, really, wanted to make Mary, Mary. In the process, I was relieved to find that toe-up socks do not have to be complicated or tricky to knit. No socks should be difficult to knit. And I feel strongly that instructions should be clear, to the point, and not intimidating. With this mind, I found ways to knit this sock without it being any harder to do than a cuff-down sock. I am quite pleased if I may say so myself! My work-arounds are not unique. I have used existing cast on and heel instructions that have been used by many other sock designers, but it took a while to find the techniques that I wanted to use. I do need to stress that everyone has their own way of doing things (as is evidenced my the multitude methods of knitting!) and there is no ‘right’ or ‘wrong’ way of knitting something as long as you get the effect you were after in the first place. The toe: I have used the Turkish cast on to begin the toe. Have you tried it yet!? It is by far, the easiest way to cast on. So fun! So simple! So effective!! Every time I cast on a toe using this method, I get a very geeky sense of knitterly joy. It has almost got me hooked on toe-up socks simply because I love this way of casting on so much! I want to cast on all the things using the Turkish cast on! I have also specified a method of increasing in this pattern which I find helps me to keep track of increase rows by using a yarn over to increase a stitch. You knit into the back of the loop on the return round, this closes the hole and creates a new stitch. It also has the benefit of serving as a marker for whether you are on an increase or return round. Backstory to the heel: My initial thoughts (as you’ll know from previous posts) were to introduce an afterthought heel, a very simple method of heel construction. I noted that many people do have issues with the fit, and I myself wasn’t entirely satisfied with how it looked in this pattern. I tried to introduce a slipped stitch into the design. While the modified heel worked for me, my tester did not find it at all satisfactory, so I decided to retire that idea for another day. The heel: In researching alternative heels, I came across a heel style used by Wendy Johnson that I have settled on for this sock. I am not sure of its origins, or even if it has an official name (it is not the short row heel). I chose it because I like its neatness, tidiness and good fit. Best of all, the instructions are refreshingly short and there is no “wrapping and turning” required! The heel turn uses the same concept as a normal cuff down flap heel. My thanks and acknowledgements go to Wendy Johnson for using this style in some of her socks. I’m not sure if she invented it, but it is awesome! I adapted the style to suit this design, and am very impressed with how well it fits the heel and ankle. In the pattern, I also provide guidance on how to work out when to begin your heel turn, which is another source of anxiety for us die-hard cuff-down knitters. 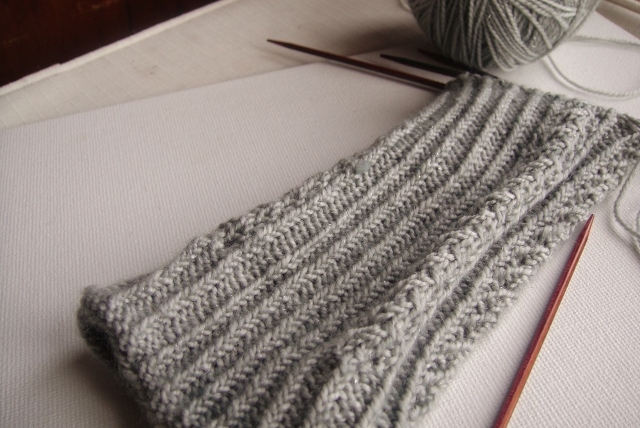 The cuff: My bind off is always on the tight side, and I have to consciously relax my grip when I do it. Even then, I often end up with an edge that is less-than-ideal for projects that need stretch, like socks and fingerless gloves. However, I also don’t like the frilly/flared look and feel of the stretchy bind off, which solves the tight bind off issue. I have worked out a hybrid style that I have coined the “half-stretchy bind off” to solve my problem with edges. This method could well be used by others too, so I don’t think I should be taking credit for inventing it. I hope you found that useful. Thanks to these discoveries, another part of the sock knitting universe has opened up to me, and I find that very exciting! I hope this post may encourage a few more knitters to try toe-up socks! Categories: Knitting techniques, Socks | Tags: designing, Knitting, knitting tutorial, sock tutorial, socks, Wool | Permalink. I recently finished knitting a pair of Geek socks which are to be a present (seems like I am doing a bit of Christmas gift knitting after all!) I took some pictures as I was knitting them to explain some of the technical aspects that are specific to afterthought heels and that sometimes catch people unawares. One of the questions I got when the pattern was first released was how to measure the length of the foot when there is no heel to measure. In the photo below, I am about to start shaping the toe of the Geek sock. The part where the heel begins on the Geek is where the waste yarn (green line) goes through the blue section – see how I have aligned it to the inner edge of the heel flap? From the green line, the measurement to the beginning of the toe shaping is the same as if you were measuring from the inner edge of the gusset/heel flap (as illustrated above). This way of measuring has never been an issue with me because I learned to measure sock length using this method (the final measurement of the sock automatically includes the addition 2″/5cm of heel depth). However, I know that others do measure from the back of the heel, and this is probably why some had difficulty. Next I went along merrily shaping the toe, and then I went back to work the afterthought heel. I completed the heel and then did a test try-on of the sock. Apologies for the poor quality of the next pic – it was taken with my phone camera to post to Instagram. Disaster! Silly me did not check against what I had written in my own pattern, and I had not worked two plain rounds after picking up all the heel stitches from the waste yarn and before starting the heel shaping. The sock was far too tight around the ankle as a result. I’m not a fan of blocking socks. My take is that they block when you wear them, so why bother! The only value that I see in sock blockers is that they make the sock look pretty if you’re going to photograph them unworn. If you are giving the socks away, I guess they do give them a certain ‘finished’ look! I’m fairly sure that most people instantly recognise this yarn, but if you are wondering, it’s Stray Cat Socks in the Aotearoa colourway. Categories: Designing, Finished Objects, Free patterns, Knitting techniques, Socks | Tags: FO, Geeks, Knitting, Knitty.com, socks, Stray Cat Socks | Permalink. The thing about knitting socks is that like all knitting, they are a very personal experience. What works for one person does not necessarily work for another. This is why there are so many very strong opinions floating around as to how to knit a sock! The below is my experience, and I have tried to not be too “Thou Shalt” about it… because what works for me does not work for everyone. The first thing you should know is this: If you haven’t knitted a sock before and would like to but are worried about how it will turn out, just Knit the Sock. Knit one vanilla sock using a basic pattern (ie stocking stitch only). Once you have knitted one, it will become your very own “swatch” sock, so to speak. Try it on, look at how it fits, work out if that’s what looks good, or whether you want to see something different. It’s worth the time to do this. This will be your base point. So, now you have your sock, and you’ve put it on, and what do you see? If you put the sock on, and it fits perfectly, you know you have got the magic formula straight away. Don’t bother reading any further. Just knit the other sock, and feel very smug that you got it right first time! Socks are generally very stretchy, and one size can fit a surprising variety of feet sizes with little difficulty. If however, there are a few niggles, the below might be useful. I think the most important thing about knitting a successful sock, more so than any other garment, is your gauge. This is because it affects both durability of the sock and fit. 1. Your own tension on the ‘normal’ sock needle of between 2.5mm and 2.25mm and how it compares to the standard gauge of 8 stitches per inch used for most socks. 2. The weight of the sock yarn you are using. A sock is always knitted at a much smaller gauge than a garment fabric for that weight of yarn. This gauge gives you a nice fit around the foot without the sock being too tight or too loose. To me, a good sock fits the foot like a glove, with no tight bits and no saggy bits, with room for your toes to wriggle. Some of this effect is achieved by the use of small needles. Many sock knitters find they automatically adjust their tension to pull harder on each stitch as they knit it, in order to create a good, tight fabric that will give that nice gentle foot “hug” that we enjoy in a hand-knitted sock. A tightly-knitted fabric will also create a more durable sock. This is one reason why super-twisted yarn is a favoured knitting yarn – it is much more gentle on the hands when knitting sock tension because it puts less stress on the fingers when knitting at tight gauge. You should not be able to see the skin through the sock when you put it on. If you do, it’s either because your stitches are too loose, or your sock is too tight. 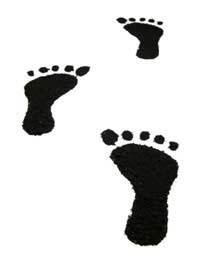 If the sock is too tight, it could be that you have got larger feet than the size you have knitted for. If the fabric is very stiff though, it means that your tension is too tight – check against standard gauge. Most socks are knitted within the 2.25mm -2.75mm needle range. If you knit loosely, you will favour the smaller needle, and if you are a very tight knitter, you will find you prefer the larger sizes. I’ve found that foot measurements for socks vary widely and appear to depend largely on the whim on the designer. In one sock book alone, I have found variations foot measurement of up to 1.5″ for the same size sock. It’s very annoying. It doesn’t really matter what the exact foot measurement is in the majority of cases (with the possible exception of extremely complicated patterned socks that need a specific length of foot), because you’re going to knit it to your length and width. My opinion is that so you don’t make mistakes, choose to knit the cast on number of stitches that best suits your own foot, worked out using your gauge (for example, in patterns that give two sizes, and you normally knit a 64 stitch cast on, and you can choose between 64 and 72 stitches, go with 64). In reality, the majority of people find that a 64 stitch cast on using regular sock yarn works well, and it’s the standard cast-on number for the majority of socks these days. 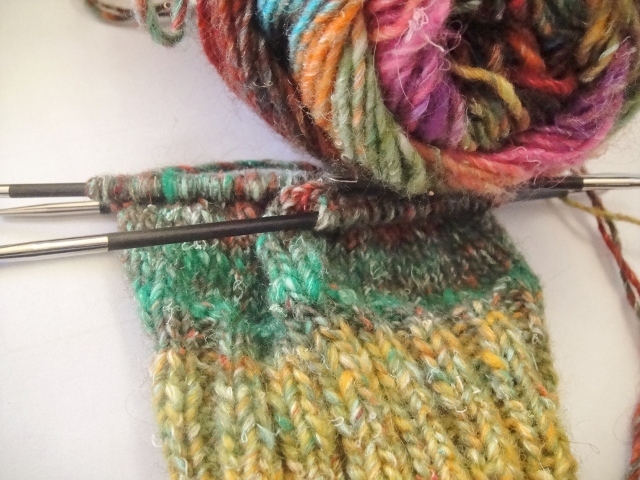 Socks with very heavy cabling may use more stitches (68 – 72), and socks with a lace pattern often have a slight difference to account for the pattern, usually between a 60 – 66 stitch cast on. I am currently knitting three pairs of socks on different sizes of needle and using different numbers of cast on stitches. The first pair is knitted in Noro Silk Garden Sock. This yarn is very fat, I’d say sport weight. I’m using 2.75mm needles, and have gone down to 56 stitches to knit these socks to compensate for the heavier yarn. I could probably get away with 3mm needles, but I’ll stick with the smaller ones for now. The second pair is alpaca/merino/nylon sock yarn dyed by Happy-go-knitty. It’s a slightly heavier yarn than most sock yarns, but it does well with 2.5mm needles. Normally, I would knit 64 stitches to get a sock to fit me. This pair is for my eldest son, so I have gone to ‘man size’ of 72 stitches. The third pair is a standard weight supertwist sock yarn dyed by Doe Arnot (featuring a bit of sparkle with 5% stellina, 20% nylon and 75% merino). I’m knitting them as suggested, on standard 2.5mm needles. There are only 60 stitches in the cast-on, but it features a bit of lace, which often opens up the knitting so you don’t need extra stitches. Each of these socks (with the exception of the ‘man’ socks) has been knitted to fit me. However, they have been adjusted as necessary to ensure they fit and suit my gauge by the adjustment of needles and number of stitches used. There’s a bit more to it than that though… read on. This is where things start to get interesting. If your calves are of average circumference, and your foot an average size, you should find you don’t need to worry about altering a good pattern. Some people though have something slightly unique, such as thicker calves, or very slim, long feet, or high arches (instep), or different shaped toes. You’ll need to do some fiddling to get a nice fit for your sock, but in general it’s an easy fix. Starting at the cuff: Top-down or toe-up? Does it matter? There is no right or wrong. It’s entirely a matter of preference, just like knitting a sweater from the bottom up or from the top down. You might like to knit them either way. Your gauge can have an impact on your choice. Do you have a naturally tight cast-on or bind-off? I have a tight bind-off. 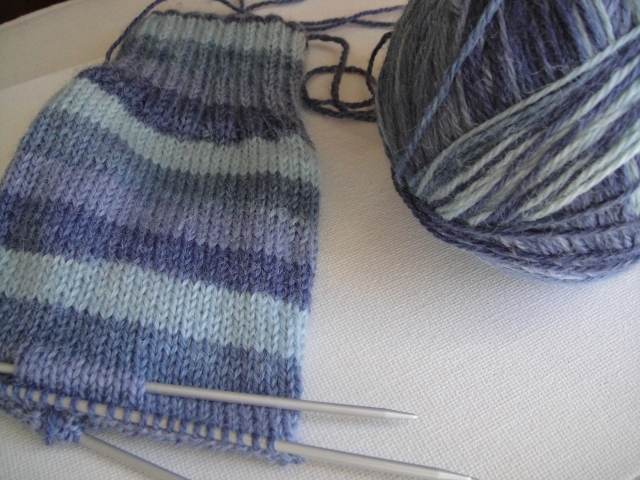 It’s very hard for me to knit a pair of toe-up socks and not get issues with a tight cuff. I have tried using the stretchy bind-off, but I dislike the frilly look of the finished edge. Plus the cuff then doesn’t hug my calf like a top-down, which then creates drooping issues… it’s all just too stressful in most instances, and I don’t see why I should fuss with extra techniques when I already know what works. I could try using a needle a couple of sizes larger to finish the sock to get a looser edge. However, my preferred stress free work-around is to knit socks top-down. On the other hand, if you have a tight cast-on, but a loose cast-off, maybe toe-up works better for you for the exact reverse reasons! Or perhaps the unique sizing of your foot means that it’s easier for you to knit toe-up. I explain further. For the most part of the rest of this post, I’m using top-down as a reference point just to keep things simple. For thicker calves that find the standard cuff too tight, I’d suggest either using a larger size needle to knit the leg only (switching back to the usual needle for the heel and foot) or you could use the same size needle to knit the leg and add on more stitches. The only thing is that you’ll need to reduce those extra stitches in order to get back to a smaller number of stitches for the foot. People with slim feet might find that the standard sock is too loose and saggy around the foot. They will need to reduce the gusset stitches to less than the cast-on number to create a narrower foot that fits better. (If knitting toe-up this will mean they increase from the toe to less stitches than noted in the pattern, and then leave more stitches on the gusset when knitting the leg to allow for width in the leg). The heel: does it sag around the ankle? It is too tight over the instep? Does the heel flap slide down under the heel? Ah, the heel. This is actually a critical area in terms of getting the fit right. I have a slightly higher instep than normal. It means that if I do not add more length to the heel flap, the sock will stretch too much over the instep and it will look ugly and feel uncomfortable. Also, the heel may do that aggravating slipping under my foot thing because there’s not enough fabric to sit nicely around my ankle. In real terms this means knitting a heel flap that is about 6.5cm long. I keep knitting the heel until it gets to that length. Depending on the pattern and the weight of yarn, it means about 18 slipped stitches (the stitches that you pick up to turn the heel), and other times it’s up to 20. If it’s a fat yarn, it might only be 15. It’s purely about knitting to get the right length. I would advise you figure out what length your heel should be to get a nice fit, rather than how many rows, because row count can change depending on the pattern you are knitting and the yarn you are using. The longer heel provides more fabric for the foot to fit into. It’s then an easy matter of reducing the stitches during the gusset shaping to get back to the right number of stitches to knit the foot. It’s another of one of the reasons why I knit top-down. I can be sure I’ve knitted the right sized heel for my foot. I can’t be bothered working out the correct measurements for all the other heel styles! 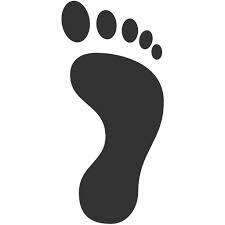 Some people have a low instep, and they will need to do the opposite if they find their socks are always baggy at the ankle. My basic guide is this: If the sock bags around the ankle or rides up, exposing the heel turn, it’s likely the heel flap is too long for your foot. If the heel flap rides downwards, and you don’t feel your heel is supported properly, it’s likely you need a longer heel flap. With top-down, I know that once I’ve finished the heel, I knit the foot to a set measurement, and then start the toe shaping. It’s a sure win for a good fit, and it works for me. Every time. Again, my experience of where to begin the toe shaping is about length. If I knit to the length that I know fits my foot, I can begin the toe shaping with confidence. There are quite a few ways to knit toes as well. I’m going to use the top-down Kitchener cast-off as my example here. then in all likelihood, you’re like me, and find that a smaller number of grafted stitches works best (in my case, it’s 10 stitches on each side) to shape around the toes nicely and not leave too much fabric around the toes that ends up being a source of annoyance. then in all likelihood, you will hate the fit of a small cast-off with a passion, finding it too tight, and need to use a larger number of cast-off (or cast on) stitches (something in the region of 12 – 16 stitches each side) for comfort. and for this person, I also use a larger number of cast-off stitches but this is to create a shallower toe so that there isn’t too much fabric around the top of the toes. In fact, for this toe, I should probably use a different style of cast off altogether (something like how one finishes the crown of a hat by drawing all the stitches together). An interesting correlation can be had in the shoe style you prefer. If you like the rounded toe shoe, then you will probably find rounded toe socks suit you better. If you like a pointy toe shoe, then you will most likely enjoy a pointier-toed sock. Phew! Well, that’s it for now. I hope that was useful. The last post on this topic will be how I have found various sock yarns have lasted. Categories: Knitting techniques, Socks | Tags: Knitting, socks | Permalink.